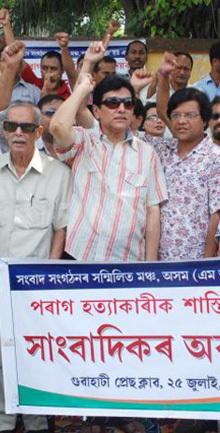 Members of Media Organization’s United Front of Assam (MOUFA), protest in front of Guwahati Press Club in Guwahati, capital of Indian state of Assam, on July 25, 2009, demanding the punishment for the killer of Parag Das, editor-in-chief of the largest circulation daily in Assam, Asomiya Pratidin. He was fatally shot in Guwahati, as he was picking up his seven-year-old son from school. He was the leading journalistic voice for self-rule for Assam and had continued covering separatist perspectives despite arrests in 1992 and 1993.
conviction has been made in any case. Committee to Protect Journalists, an international media rights body has recently disclosed that 864 working journalists around the world have been killed in different incidents since 1992. The New York based media rights body also reveals that India is one of the 13 risky countries where journalists are murdered on a recurring basis and governments are unable (or unwilling) to prosecute the killers. Other nations, where journalists are targeted regularly for deaths and governments fail to solve the crimes include Iraq, Somalia, Philippines, Sri Lanka, Colombia, Afghanistan, Nepal, Mexico, Russia, Pakistan, Bangladesh and Brazil. Among the journalist victims, 547 journalists were killed with complete impunity. The CPJ also reveals that India is one of the first 20 countries where journalists are murdered on a recurring basis and governments are unable (or unwilling) to prosecute the killers. India officially records 15 unsolved cases of journalists killing with impunity. Other nations, where journalists are targeted regularly for deaths and governments fail to solve the crimes include Iraq (unsolved cases: 93), Philippines (64), Algeria (57), Colombia (35), Russia (29), Pakistan (20), Mexico (20), Somalia (18), Rwanda (15), Tajikistan (14), Turkey (14), Brazil (13), Sri Lanka (10), Sierra Leone (9), Afghanistan (9), Bangladesh (8), Angola (7), Cambodia (7) Peru (6) etc. The CPJ’s Impunity Index 2011, compiled as part of the organization’s global campaign against impunity, indicates that local journalists remain the victims in the vast majority of unsolved cases throughout the world. The CPJ research shows that the deadly, unpunished violence against journalists often leads to vast self-censorship in the rest of the press corps. More over, the situation finally compels many journalists to avoid sensitive topics, leave the profession, or flee their homeland to escape violent retribution, informed CPJ Executive Director Joel Simon. Working in insurgency stricken Assam, which publishes nearly 25 morning daily newspapers and supports 6 local satellite news channels is increasingly becoming dangerous for working journalists. The ongoing insurgency and unrest among the youth of this region, where over 15 armed outfits have been fighting New Delhi on various demands varying from sovereignty to self-rule, put tremendous challenges on the journalists based in the State. The media persons, most of them are out of insurance cover are subjected to numerous threats from insurgents, surrendered militants and even the anti-insurgent security agencies. The victim editor-journalist-correspondents of Assam include Punarmal Agarwala (killed by the banned militant outfit United Liberation Front of Asom in 1987), Kamala Saikia (killed by ULFA in 1991), Pabitra Narayan (1995), Dipak Swargiary (1995), Parag Kumar Das (shot dead in broad day light in 1996 by surrendered ULFA), Manik Deuri (killed by Bodo militants in 1996), Panja Ali (1997), Nurul Haque (1998), Ratneswar Sarma Shastri (killed by ULFA in 1999), Dinesh Brahma (2003), Indramohan Hakasam ( 2003), Prahlad Gowala (killed by timber mafia in 2006), Bodosa Narzary (2007), Mohammad Muslemuddin (2008) and Jagajit Saikia (2008), Anil Majumdar (2009), Bimala Prasad Talukder ( 2010) etc. But surprisingly enough, not a single perpetrator of all these killings has been punished till today. The author is a Guwahati (Assam, Northeast India) based journalist.